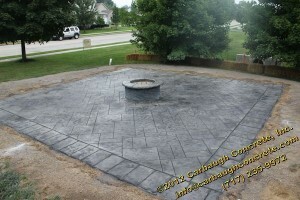 Project: Install a new stamped concrete patio with a stamped concrete fire pit and a plain concrete slab. Our customers were trying to make their outdoor space more livable. They wanted an area for an outdoor kitchen space and a separate area for an outdoor living room, complete with a stamped concrete fire pit. The fire pit is one of the newest additions to our lineup of stamped concrete offerings and it made a stunning addition to this outdoor living area! For this project, we used our Regal Ashlar stamp pattern set on a bias to enhance the appearance, a Slate border, and our beautiful new Stacked Stone Fire Pit. 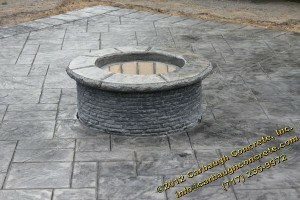 Contact us today to schedule a free estimate for your own patio or fire pit! 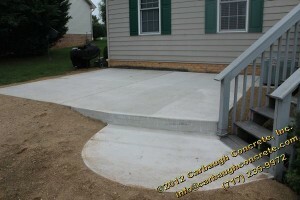 See additional images of our stamped concrete projects in our gallery.